Greenland and Wild Labrador – The Great Canadian Travel Co.
2020 sailings, save 15% for bookings made by October 31, 2019. (See Tour Notes for details). 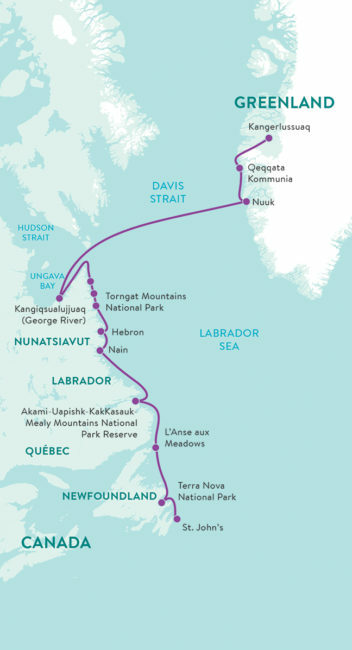 This extraordinary sailing showcases a staggering geographic diversity, departing from the fjords of the west coast of Greenland, across the Davis Strait and down the the rugged coastline of Labrador and finally to picturesque St. John’s harbour. Prices are shown in US$ per person based on four people sharing a quad cabin, three people sharing a triple cabin and two people sharing a twin cabin. Single use cabins are available in categories 3-7 at the per person twin price, subject to availability. There are a limited number of single cabins on the ship. 18 September, 2019, northbound only (Toronto to Kangerlussuaq) – US$1,245. Prices in US$ per person, inclusive of all taxes and fees. 23 September, 2020, northbound only (Toronto to Kangerlussuaq) – US$1,295. Prices in US$ per person, inclusive of all taxes and fees. After our flight from Toronto, we will embark the Ocean Endeavour and make our way down spectacular Sondre Stromfjord, for a chance to experience its beauty. Sondre Stromfjord is one of the longest fjords in the world and boasts 168 kilometres of superb scenery! Kangerlussuaq, the town at its eastern head, means ‘the big fjord’. From Greenland’s deep fjords, fed by glacial water, we explore the coastline and may even be lucky to spot musk ox grazing on the hills. We’ll visit Nuuk, one of the the world’s northernmost capital cities, before we head across the Davis Strait towards Canada. During the crossing we’ll be on the lookout for icebergs, whales and a multitude of seabirds. The Labrador coast has to be seen to be believed! We will do more than see it, as we head ashore on daily Zodiac expeditions to hike the secret wilds of Canada’s hidden coast. 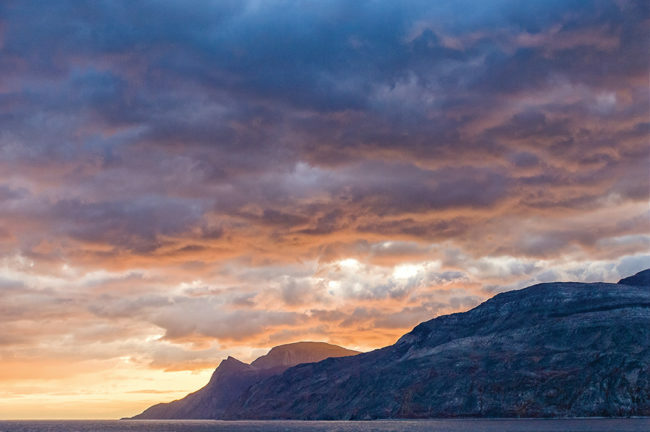 We wend our way into the stunning fjords of the Torngat Mountains National Park. In the park, mountains will tower above us as the azure waters mark our passage below. We will be on the lookout for polar bears, seal and, of course, the abundance of different kinds of birds. Further south along dazzling, rocky coastlines and call at immense beaches and long-abandoned communities. We’ll stop at L’Anse aux Meadows to pay our respects to North America’s Viking visitors before travelling along Newfoundland’s northeast coast, dotted with quaint, little villages. Finally we finish our journey entering through the Narrows into St. John’s harbour. 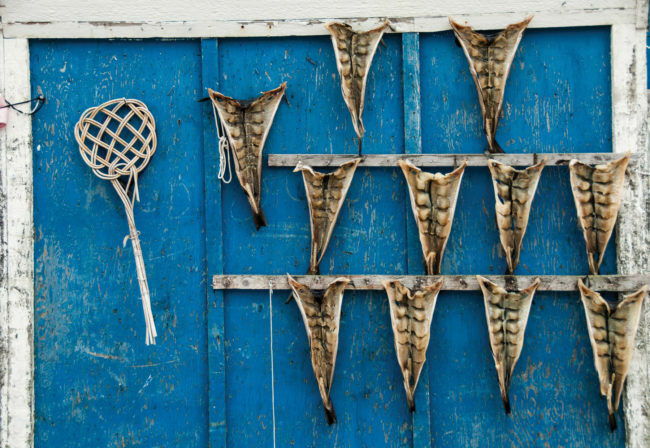 There are a number of charming fishing villages along the west coast of Greenland—depending on timing and sea conditions, we will call in at one of these communities to experience small town Greenlandic life, or we may navigate into the stunning fjords that line the coast. This is a day in the true spirit of expedition travel and we will avail ourselves of any and all opportunities that present themselves. Welcome to Nuuk, the capital of Greenland and one of the world’s northernmost capital cities! Nuuk means ‘the headland’ and is situated at the mouth of a gigantic fjord system. Established in 1728, Nuuk remains the bustling centre of the country today. We have the chance to spot humpback whales in the fjord, reindeer roaming the land, and birds soaring above. The town is home to the University of Greenland, a cathedral dating back to 1849, and Greenland’s National Museum. We will visit some of the city’s most important sites, and you’ll have some free time to explore on your own. Our presentation series continues as we head across the Davis Strait towards landfall in Canada. While out on deck keep your eyes peeled for minke and humpback whales (and other marine mammals), as well as the seabirds that are sure to mark our passage. In the shelter of a commanding granite rock outcrop we find the easternmost community of Kangiqsualujjuaq, or George River. Twenty-five kilometers upstream from Ungava Bay, the ebb and flow of the tides define the summer lives of the people and fauna of this area. 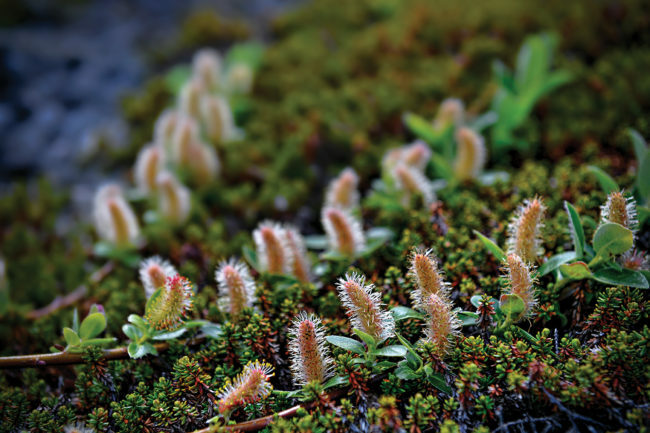 Arctic flora thrives in the protected valley. The calving grounds of the George River herd, the largest population of Woodland Caribou in the world (estimated at several hundreds of thousands of head) is nearby. After our welcome back to Canada, we will have the freedom to explore the community, meet with locals and strike out of town for a hike on the tundra. 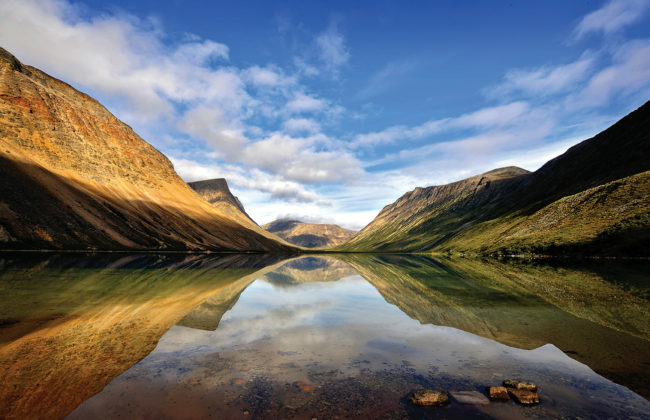 The Torngat Mountains have been home to Inuit and their predecessors for millennia, with archaeological evidence reaching back almost 7,000 years. The fjords here reach deep into the heart of the mountains, bounded by cliffs peaking at 1,700 metres, the highest point of land in Labrador. The rugged, spectacular beauty of the Torngat Mountains underscores their role as the spiritual homeland of Nunatsiavut. The Torngat Mountains comprise some of the oldest rocks on the planet and provide some of the best exposure of geological history. 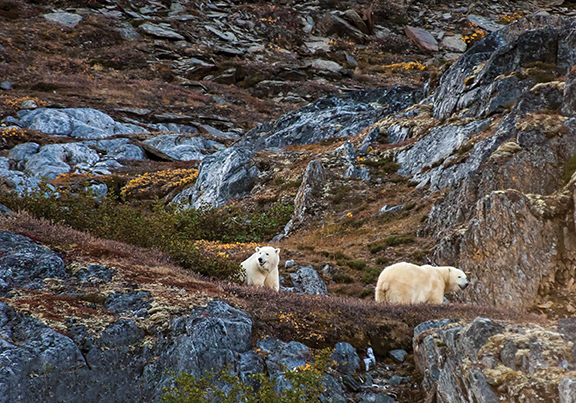 Polar bears, caribou, falcons, and eagles are among the species hardy enough to make their homes here. We’ll spend our time here getting out on the land for hikes, searching for wildlife, visiting archaeological sites, and Zodiac cruising through some of Canada’s most dramatic landscapes. Hebron is now abandoned. A Moravian Mission station was constructed here from 1829 to 1831 but the main buildings—the church, the mission house, and the store—were not inhabited until 1837. In a highly controversial move, the station was abandoned in 1959 with the departure of the Moravians, forcing the relocation of the Inuit who resided there. In 2005, Newfoundland and Labrador Premier Danny Williams apologized to people affected by the relocations. In August of 2009, the provincial government unveiled a monument at the site of Hebron with an inscribed apology for the site closure. Today, some of the buildings at Hebron are being repurposed as a cultural interpretation centre and it is these buildings that we will be visiting. They form a lonely monument to the cultural past of the area, with hopes for the future of Nunatsiavut. 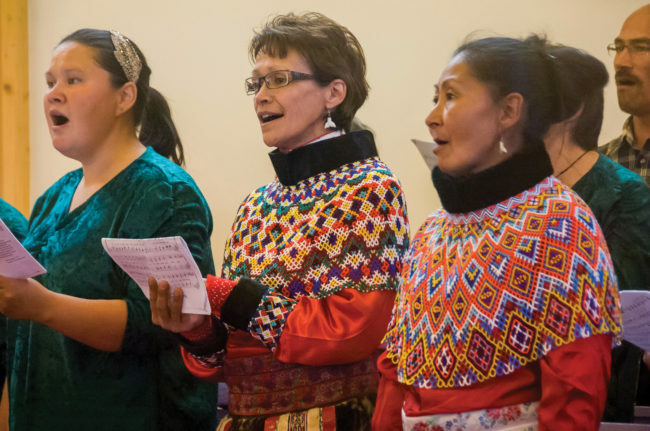 Today we explore the Inuit community of Nain, known for its Moravian Church, the Nunatsiavut Building with its Labradorite stone and the newly finished Torngâsok Cultural Centre. Local leaders will share the fascinating history of the township, and we will have a chance to visit with the community. The lower Labrador coast boasts five of Labrador’s ten provincial eco-regions, including coastal barrens, high subarctic tundra, high boreal forest, mid boreal forest, and string bog. The Mealy Mountain range in this area reaches heights of more than 1,000 metres. A significant portion of the mountain range and surrounding area has been recently designated a potential National Park Reserve, a move which follows lobbying for the preservation of the area since the early 1970s. The governments of Canada and Newfoundland and Labrador have agreed to pursue creation of a National Park Reserve, which would see the area managed as if it were a national park, pending settlement of Native land claims. Once settled, the area would likely be designated a national park, comprising approximately twenty thousand square kilometres. We will explore the park and surrounding landscape, making expedition stops as they present themselves. A UNESCO World Heritage Site, L’Anse aux Meadows is the only authenticated Norse settlement in North America. The archaeological remains found here in 1960 date to approximately 1000 AD. Amazingly, the location of the ruins was first established by a close reading of the Viking sagas. Today, a superb interpretive centre and reconstructions of the several Norse-style sod buildings make L’Anse aux Meadows a must-see for any visitor to Newfoundland. Today we call in at Newfoundland and Labrador’s first national park, Terra Nova, located in beautiful Bonavista Bay. Our approach course will wind through the small islands that do the route and the occasional icebergs that drift in from the Atlantic. Once ashore, we have a variety of hiking opportunities in the park, where we hope to observe some of the black bears, osprey and moose that call the park home. Sailing into St. John’s has to be experienced to be believed; Signal Hill keeps watch over the world-famous Narrows where icebergs are frequently seen. The bustling city of St. John’s with its colourful houses and steep streets makes a spectacular backdrop to the legendary quay where we will bring our journey to a close. Disembark and make your to the airport for departure or to an area hotel if you have booked on an extension. Should you wish to extend your stay in charming and colourful St. John’s for a night or two, we can quote you on accommodation and perhaps a local day tour of the city and surroundings. Just ask!